There is some confusion to what sugar is. We consider sugar to be that white powder we find in bags at the supermarket. More clever people recognize it as foods that are sweet. What we don't recognize is, it doesn't have to be sweet to contain sugar. Fats, carbohydrates, and protein. Fats turn into fatty acids, protein turns into amino acids, and carbohydrates turns into sugar. Which is why carbohydrates and sugar is used interchangeably. So people who may not have associated alcohol or breads with sugar, once they see the carbs/sugar connection, realize they may be consuming more sugar than they realize. Sugar got into all of our foods because of it's taste and because we considered it to be benign. It's empty calories but has no ill effects. This was due to the calories model. If you believe the worst health risk is high calories, then sugar (carbohydrates) wasn't the problem, the problem was fat. This is because per gram, protein has 4 calories, sugar has 4 calories, and fat has 9 calories (incidentally alcohol has 7 calories per gram). Fat was wrongly thrown under the bus and since animal protein usually comes in a package with saturated fats; it was also thrown under the bus, which only left sugar to become the top additive. Thanks in large part to the influence of Ancel Keys. We replaced saturated fats that we've been eating for thousands of years with hydrogenated vegetable oils otherwise known as trans-fats. Wasn't long after, that obesity, diabetes, and heart disease skyrocketed. 1 calorie of sugar is exponentially more intense than 1 calorie of protein or fat. A calorie is not a calorie and in high doses, sugar becomes toxic. Our body produces cholesterol and fats to deal with excess sugar, it's how we maintain balance. Carbohydrates in healthy amounts is fine; vegetables and fruits are both carbohydrates, but the average American diet is dangerously above a healthy limit. We have also refined sugar to be much sweeter than it could have ever been naturally. 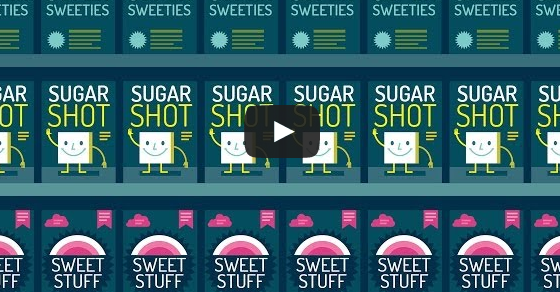 Every day companies figure out how to make sugar sweeter and contain less calories. Right now there are so many variations on 0 calorie sugar and they're getting sweeter and sweeter. The problem with sugar isn't the calories. In fact when sugar has 0 calories, it becomes even more toxic. That implies if you're fat it's because you're lazy and you eat too much. What about an overweight infant or toddler? Should they diet and exercise? Was not exercising and eating too much the cause of their obesity? The energy balance explanation doesn't explain anything. It's what big food and big health wants you to think, they want you to blame yourself. It's another form of shame and it's a way to keep people unhealthy. If you keep thinking this way, you can still eat sugar. Even healthy sugars are being over-processed. 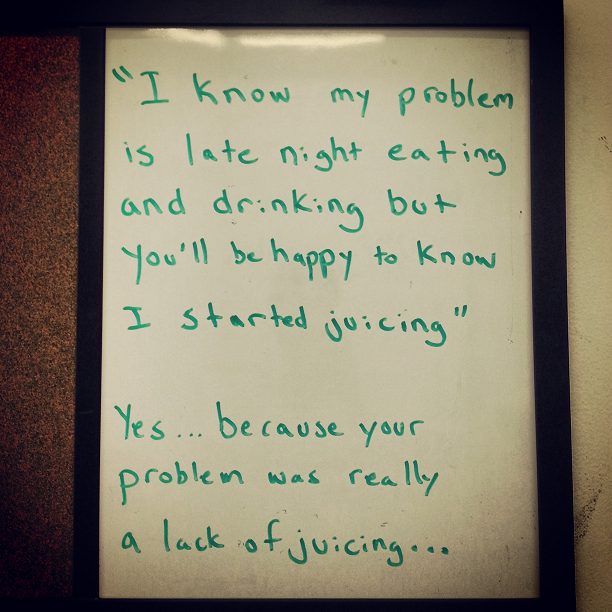 Our juice consumption is pushing us over the healthy limit tipping point. Normally fruit comes in a package with fiber, fiber slows the absorption of sugar which then regulates the dosage we get it in, allowing our liver to do its job. Lately the popular trend is to either blend all the juice and fiber into a smoothie, or get rid of the fiber all together, and on top of that you're drinking it which makes consumption time even more rapid. This overloads the liver, which is never a good thing, not to mention what it does to your gut flora. You're liver basically cleanses anything that you put in your body, not just sugar but even vitamins and chemicals. When you give it high doses of too many things, it makes it difficult for the liver to do it's job, possibly even damaging the liver. Unfortunately we only have one liver. Sugary sports drinks, health powders full of sugar, sugar pills, supplements, energy drinks, processed "health" foods, and other sweet foods promising to be loaded in antioxidants are considered currently the standard of health. It's a multi-billion dollar business that only wants to grow. Whatever you want to call it and dress it up as, it's still refined food. You put sugar into coffee, that's reasonable. You put butter in your coffee, that's toxic. That's conventional wisdom. Few if any are going to the emergency room due to a lack of antioxidants. Many are going in due to a lifetime overload of sugar. We maintain our bad behaviors by trying to compensate with what we believe to be "good behaviors" and it's making things even worse. Just stop your bad behaviors, it's more effective. There's a healthy fear of GMO (genetically modified organisms), but GMOs are mostly used to make fruits and vegetables pest resistant. Even without GMO, farm companies have been making our fruits and vegetables sweeter and bigger, which is a threat that's already hurting our health. It's not something we speculate about, like we do with the effects of GMO. Whether it's too much "good" food or "bad" food, we're basically on a 24 hour sugar IV. People associate good health with less calories, less fat, maybe less meat, and more vitamins. People are willing to give up fats, meats, calories, but few people are willing to drastically lower their consumption of sugar. Because sugar frankly tastes better than everything else. We dance around the real problem and want to believe getting rid of something else will alleviate the problem. What really ends up happening is, when we get rid of something that isn't sugar and we end up eating more sugar. We give up something else to compensate for our consumption of sugar, which give us some room to eat more sugar. I hear this at least once a week from new client consultations, "I know my problem is I eat too many sweets. Lately I decided to give up red meats..." Therein lies the problem, I know my problem is A, A is too hard to give up, so I'll give up B and hopefully that'll solve A. I know my problem is sugar, I'll give up meat, and hopefully that'll resolve sugar. I know my problem is sugar, so I'll work out more, and hopefully that'll resolve sugar. I know my problem is sugar, I'll detox, and hopefully that'll resolve sugar. To resolve A, stop doing A. This isn't just true for sugar, we use this mental negotiation for everything. I know my problem is late night eating, so instead of stopping late night eating, I'll start spinning. I know my problem is stress, so instead of reducing stress, I'll add more healthy stress. I know my upstairs neighbor is noisy, so I'll tell my downstairs neighbor to be quiet. I know I have an abusive boyfriend, but you'll be happy to know I got a puppy. If you identify the problem, solve the problem. That's where you'll gain the most benefit. Don't use the "at least" excuse. Well at least I don't do this, well at least I do more of that. If the problem doesn't get resolved, it's only going to get worse. Especially don't compensate for too much sugar by drinking sugary fruit juices! There's a lot of incentive for big food (big sugar) companies to keep us addicted to sugar. They can make a lot of money by putting low calories, low fat, and vitamin fortified on the labels. There is no "big fat," no giant food conglomerate trying to get us addicted to saturated fats. Big food could care less if we don't eat fats because that's not the business they're in. And since we're opposed to animal fats, they're in the business of alternative fats made from vegetables like trans-fats. Kerrygold butter is not big food, neither is Fatworks who makes duck fat for cooking. Fat and protein also cannot stimulate our brain and create addiction the same way sugar (refined carbohydrates) can. Seldom will you hear someone talk about their incredibly intense cravings for butter or eggs. Sugary, starchy, carby foods? Yes. Our relationship with sugar is so powerful, we were willing enslave other cultures for it. Big food doesn't want you to think sugar is dangerous, and WE don't want to believe sugar it's dangerous. Big health repeats the same sentiment. It's not that the message isn't out there, we don't want to hear it because we don't like that message. So we want to believe the messages we do like. Science isn't about picking and choosing beliefs we like, science is about truth. We voluntarily get dogmatic with our beliefs about food, sending us into a health crisis. Things can only get better if we're willing to face the unpleasant truth and clean up our act.